With a revamped lineup and reinvigorated sound, Acappella returned with a new album for a new generation. 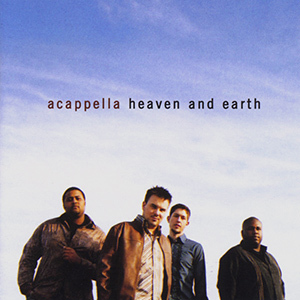 Winner of the Contemporary A Cappella Recording Award for Best Religious Album in 2005 from the Contemporary A Cappella Society, Heaven and Earth is definitely not your daddy’s Acappella… but he’ll love it too! With Gary Evan’s heart-stopping bass, an R&B vibe, soulful melodies and great vocal percussion, this album draws from the musical roots of its singers as it delivers the message of Jesus Christ loud and clear. Listen for yourself. You won’t be disappointed.